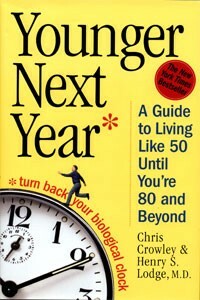 Younger Next Year is a consumer book that promotes vigorous exercise as a means to improve longevity and quality of life. Recommended for: It is intended for older adults, however, it is appropriate for all audiences, especially those who are out of shape. The book's subtitle is: "A Guide to Living Like 50 Until You're 80 and Beyond." • Chris Crowley is an attorney in New York City, and a patient of Dr. Lodge. • Henry S. Lodge, MD is a physician who practices internal medicine in New York City. He is on the faculty of Columbia University's College of Physicians and Surgeons. Chapter 2: How's Your Wife? Chapter 14: Don't You Lose a Goddamn Pound! Chapter 17: "Teddy Doesn't Care!" The lead author of Younger Next Year is Chris Crowley who, at the time of publication, was a 70-yr old attorney in Manhattan. This book is an outgrowth of his relationship with his personal physician, internist Henry Lodge, MD. As a result, Crowley has become an evangelist for the health benefits of exercise. These are laudable principles, no doubt. However, Crowley, who writes 14 of the 21 chapters, forces us to wade through a meandering, conversational-like explanation of these points. He can't resist telling us about his skiing abilities, his sailing background, and other aspects of his personal life that just make for tedious reading. His writing style seems more like a cross between a diary entry and a personal e-mail message. Unfortunately, despite identifying 7 principles which, in my opinion, are excellent guidelines to live by, the book doesn't really give readers any evidence supporting them. For example, some research now shows that the elderly can enhance strength by doing weight-training as infrequently as once per week. Certainly, Younger Next Year is not meant to be a review of exercise research, however, the reader deserves at least some basic explanation of the foundation of these extremely dogmatic exercise guidelines. Why do they recommend strength-training twice per week if some research shows that once per week might be effective for some? And, what, then, is the desired outcome? Fewer falls? Less joint and back pain? As the scientific half of the duo, Lodge, who writes 6 chapters (the final chapter is co-authored), has the primary responsibility of delivering this "evidence" to the reader. However, his chapters tend to focus too much on the evolutionary basis of human physiology and biochemistry. In chapter 5, Lodge goes into detail about cytokines and how they contribute to aging. Since I have a background in pharmacology, I found this interesting. But, even though it may help to explain the basis of aging, I think that this sort of information is likely lost on most readers. I simply don't understand why Lodge doesn't make some rudimentary attempt to provide evidence of the health benefits of exercise. For example, tell readers about the study showing that walking as little as 20 minutes per day reduced the incidence of high blood pressure in Japanese men. Or, explain that cycling and swimming are not very good options for maintaining bone density. Describe just a few of the countless studies showing the health benefits of long-term running. Consumers can relate that kind of information to their lives more directly than a summary of how mitochondria function or an esoteric analogy of lions chasing antelopes. Throughout the book, the authors keep stating that 70% of premature death and aging is preventable (p. 29), but they never explain how that number is derived. Another oversight in concept is not clarifying what the intended benefits of their exercise program are. The book's subtitle implies that "longevity" is the goal. If so, then walking and simply being active on a daily basis should be discussed more, as these strategies have been shown to lower the incidence of cardiovascular diseases such as heart attack and stroke, which are still the biggest causes of death in adults in the US. However, to achieve weight loss in overweight and obese (and, thus, realize a reduction in morbidity and mortality in this group), more than 45 minutes per day may be necessary. In other words, different patients require different regimens. Crowley and Lodge take a "one size fits all" approach. In fact, that's exactly what they call it (p. 319-321). I could not find one single reference to any American College of Sports Medicine (ACSM) exercise guidelines for adults. This is unfortunate because ACSM recommendations are the foundation for optimum health. Younger Next Year was published in 2004. In 2007, ACSM published new exercise guidelines. While they do a good job of advising readers to monitor their exercise heart rate, it would be helpful to provide a simple chart illustrating target heart rates vs. age. Finally, there is no discussion of balance exercises, something that is very important for the elderly. 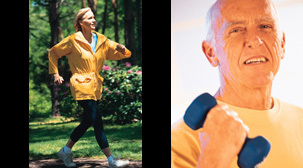 Crowley and Lodge advocate regular exercise as the #1 thing people can do to slow the aging process. However, they fail to adequately support the many dogmatic recommendations they make. Thus, I feel this book misses the mark. • What I Liked: The authors encourage exercise. Certainly, this is a good thing. • What Could Be Better: Provide some evidence of specific health benefits of specific amounts and types of activities; eliminate Crowley's conversational and sometimes crude writing style. This book was published in 2004 and was on the New York Times Best Seller list. While there are some good messages here, I almost couldn't finish reading this book. The writing style of Crowley, coupled with a discussion of evolutionary concepts in lieu of clinical evidence, made for a frustrating read. Because of the one-size-fits-all approach and the lack of adequate clinical evidence to support many of their points, I feel this book fails the reader. If you want some diversionary reading, then you may enjoy this book. But, if you want a book that offers solid, evidence-based exercise plans for older adults, then I cannot recommend Younger Next Year. A better choice, I feel, is Fitness Over Fifty. This book has better information in fewer pages, and it even comes with a DVD!